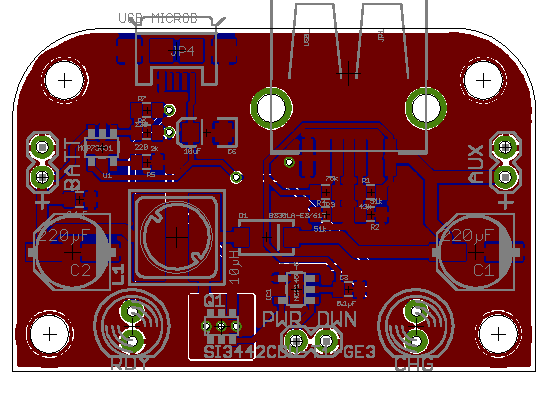 I've been buying and using SparkFun's ISP Pogo adapter, but there are a couple of things about it's design that - at least for me - could be improved. The basic design - two boards that are rigidly fixed in a precise vertical alignment each supporting the pins - is good. But I don't value the Molex and JST connectors. I'd rather be able to grasp more easily onto the top board without having so much stuff in the way. Fortunately, designing one isn't hard. Just put two 6 pin AVR ISP footprints on a board and connect each related trace. You use a pair of boards to make one fixture, and since they're both the same, they'll both align perfectly. You use a pair of 1/4" #4 unthreaded spacer between the two boards and a 1/2" #4 bolt and #4 nut to hold the boards together. With the spacers, there will be enough room on the lower board to install a right-angle DIP header, leaving the top of the top board completely open and usable as a grip/pressure surface. You assemble the adapter and align the pogo pins the same way SparkFun says to do it on theirs. Start by attaching a 2x3 right angle DIP header to what will become the bottom board, making sure to install it on the TOP of the board, and that it doesn't stick up more than 1/4 inch (so that it won't touch the top board once it's in place). Next, mechanically assemble the two boards together with the two machine screws, spacers and nuts, making sure that the TOP of each faces the same direction and is oriented the same way. Next, temporarily attach a piece of cellophane tape to the top of the top board, then insert the pogo pins through the bottom board and into the holes of the top board so that they rest against the tape. Carefully check the pins to make sure they're straight and level. If the pins are racked, twist the boards so that they're straight, loosening the hardware if necessary. Solder the pins to the bottom board, then remove the tape and solder the pins from the top of the top board. The second footprint on the top board will be left unconnected. It turns out that SparkFun's drill holes are the same diameter as the Pogo pin itself. They may be counting on their PCB vendor consistently erring on larger holes. I can only hope that OSHPark does the same. A snug fit is ok, but not fitting at all would be bad. We'll see. I envision bigger things from this design, potentially. Because the top is (nominally) flat, you could remove the top two screws and screw longer ones in, attaching the whole adapter to a larger programming jig, possibly for mass programming panels of devices all at once. The only hard part of that is figuring out how to get avrdude to individually address multiple USBTiny programmers simultaneously attached. I've been mostly guessing about the power consumption of the Crazy Clock controller. But today, I validated my guesses. My Rigol DS1052E doesn't have an integration function. As Dave explained recently on EEVblog, integration is the best way to quantify power consumption when the waveform is complex. If you can graph amperage against time and integrate that, the result is energy consumed against time - mAs/s. It's not exactly analogous, because the mAs/s isn't really a rate. It's the number of mAs consumed in a second's worth of time. I took the whole kit-n-kaboodle to work today early and performed the integration. The result was that while the controller sleeps, there's around a 1 kHz complex waveform consisting of a sharp rise to 1.25mA or so, then a decay down to 0. My Rigol scope said it was an average of around 220 µA. But is that accurate in terms of energy consumption? The integration function over one cycle of that complex waveform reported 220 nAs (actually, it was 220 µVs, but with a µCurrent Gold set for the µA/mV scale, so change Volts to Amps and divide by 1000). Since that was over the course of 1 ms of time, it's 220 nAs/.001 sec, or 220 µAs/s - the same as the 220 µA average current reported by my Rigol. And that makes logical sense as well. The boost converter is turning 1.5 volts from a AA battery into 3.3 volts, and the datasheet says it should be doing so at roughly 80% efficiency. The ATTiny while napping should be consuming around 100 µA @ 3.3 volts when clocked at 500 kHz. In principle, that means that the battery draw should actually be something like 275 µA, so it's probable that either my measurements are a tiny bit off, the controller is a tiny bit more frugal or the boost converter is a tiny bit more efficient. Or all 3. But it's still in very much the correct ballpark. For the first time, I'm stymied. I've made mistakes since I started this making thing. All of them have been learning opportunities. If you've bee following me on twitter, you'll have seen some "Tips du jour" - most of those are lessons that I've learned from figuring out what I did wrong. Well, now I've got a situation I can't figure out. I have the same circuit on two different boards. One one board, it works perfectly. On the other, it doesn't work at all. 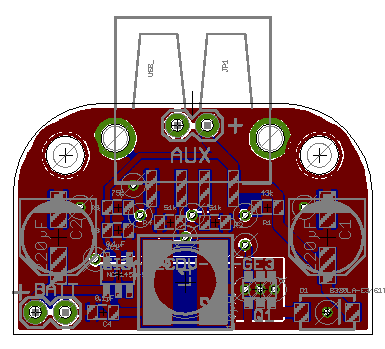 The circuit in question is a boost converter based around the NCP1450-5 boost controller. Both circuits have the identical schematic. The board layouts differ, but I've conferred with a colleague at work and he didn't see anything wrong with it either. The symptom is that with no load, the output is 5 volts. But while circuit A can supply up to an amp of output with less than a tenth of a volt of sag, barely 100 mA of load on circuit B is sufficient for the voltage to sag down to the battery voltage. It's as if the controller "gives up" on trying. My first thought was that the feedback sampling was being drawn from too close to the output of the regulator as opposed to near the load. But if you do the math, there isn't enough voltage drop on the traces of either design to account for anything. I then thought that perhaps the output filter cap was too far away from the cathode of the diode. So I added a 68 µF tantalum cap tacked onto the end of the cathode and a short wire to ground. That didn't help. The board that doesn't work also has a LiPoly battery charger on it, but the exact same circuit on a separate board has been used in concert with the working version of the booster board for a while now, so the mere presence of that circuit doesn't cause any trouble (and why would it anyway? ).